The voting is over! Thanx to all 1500 voters! The winner is Maxtreem with his mix “Champion Sound” and 349 votes. Rude Lion with his “Underground Generation Mix” got the silver medal (319 votes) and third is Frisk with “King Of A Lion” (130 votes). Congratulations! Just check the results below. I agree to Selecta Jahrob’s comment: bless everyone! its an honor to be a part of this voting poll! many many very good mixes but just remember its a mission not a competition, seen!! With this vote we wanna support all our jungle-friends and -dj’s who are showing us their mixing skills with their own selections of tunes. Big up 2 all selectas and producers and thanx for a big year 2011 and for a bigger year 2012. Special big up to the Psychoradio-crew! This is a selection of the most commented mixes in 2011 or we prefer and which are online right now. To listen to dem please click the links below. The results of the 2010 vote you can find here. and BIG UP ALL SELECTAZ!!! big up all junglists for your support of me! @selecta jahrob: WORD!!! thats what its all about…spreading the vibez…have some fun…love music…nothing more nothing less…. bless everyone!! its an honor to be a part of this voting poll!! many many very good mixes but just remember its a mission not a competition, seen!! the vote starts now till end of january. You can vote for your top 5 mixes! is the contest still going or is it finished??? or ??? 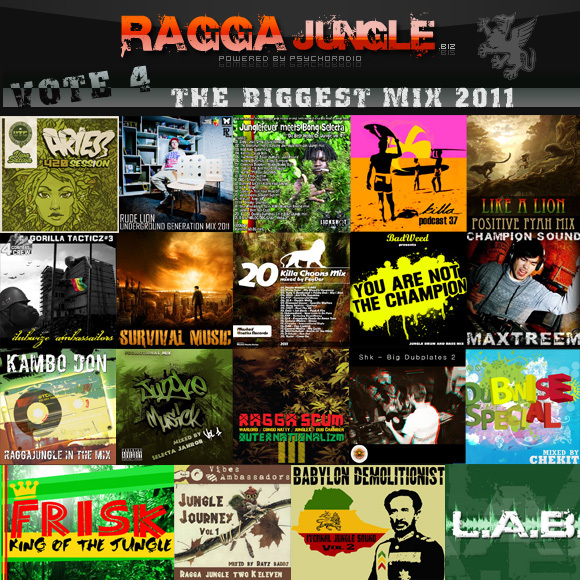 have a great 2012 big up all raggajungle.biz massive& crew!!!KABOOOOOM! if you do not know anything personally about me – it’s your problem. “miksklaud” site does not exist. you’re talking about thousands auditions – people listen and they like it. what’s the problem? and im not worried about favorites. disgrace the country like you – who instead of what to support, trying to discredit. Dear Maxtreem and Rude Lion. Please stop spamming and cheat to vote. I don’t know how you do it, spam, or enter through proxy servers, but what you do is not honestly and this is obvious. You compete with each other and there are days when you got about 50 votes per day, how is that possible? I live with you in one city, I haven’t seen you in the lineup at the big jungle activities, I haven’t seen you almost nowhere, whence this support? Rude Lion on your link I can see that from thousands of auditions, only 15 favorites, so why there are 228 votes for your mix? Why do these people do not support you on mikskloude? Maxtreem Rude Lion, do you really think that people will believe in the fact that out of 1,000 votes the 500 was given for your mixes? Your mixes have a better support than mixes Dj K, 4 Corners Crew, Run Tingz Cru, are you kidding me? Don’t disgrace our country and play honestly! DJ L.A.B is most massive ! All di others are wikkid too! Jungle is jungle baby! where Live: MURDA SOUND #3 – HoT live 27 nov 2011? I know I am posting a lot this week, but end of term, I am either doing academics or athletics (gym or running) and like I said this music this site is sanity…. Well I know what I am listening to. Happy it goes to end of January. To all singers & players instruments Thank you. To mixoligists & DJ jungelists Thank you. To the one named Mash Thank you. You never value till you dont have, living in a small small country town that don’t even know the name RaggaJungle (not hating just stating) this site and all who post are my musical happiness & sanity. ma also voted for shk!! there are some really good mixes on that list.i can’t decide what to vote..
Heeey, guys!!! Do you really think that here is something better than Shk – Big Dubplates 2??? Then try to listen it again! Come on!